By following the US Department of Agriculture's food guide, called MyPlate, you can make healthier food choices. The new guide encourages you to eat more fruits and vegetables, whole grains, lean proteins, and low-fat dairy. Using the guide, you can learn what type of food you should eat and how much you should eat. You also learn why and how much you should exercise. You should eat foods from each group every day. How much food you should eat from each group depends on your age, gender, and how active you are. 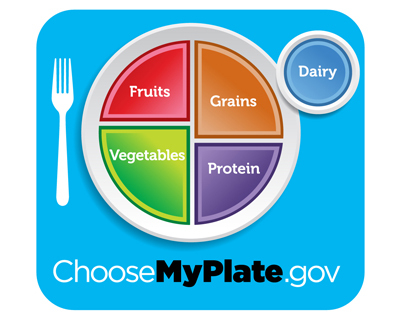 MyPlate makes specific recommendations for each type of food group. Whole grains contain the entire grain. Refined grains have had the bran and germ removed. Be sure to read the ingredient list label and look for whole grains first on the list. Foods with whole grains have more fiber and protein than food made with refined grains. Examples of whole grains are breads and pastas made with whole-wheat flour, oatmeal, bulgur, faro, and cornmeal. Examples of refined grains are white flour, white bread, and white rice. Reducing the risk of many long-term (chronic) diseases. Whole grains can help you lose weight. Portion size is still key. Because whole grains have more fiber and protein, they are more filling than refined grains, so you can eat less to get the same feeling of being full. But if you replace vegetables with starches, you'll gain weight, even if you eat whole grain. Whole grains can help you have regular bowel movements. Use whole-grain pasta instead of regular pasta. Replace part of white flour with wheat flour in recipes. Replace white bread with whole-wheat bread. Use oatmeal in recipes instead of bread crumbs. Snack on air-popped popcorn instead of chips or cookies. Vegetables can be raw, fresh, cooked, canned, frozen, dried, or dehydrated. Vegetables are organized into 5 subgroups based on their nutrient content. The groups are dark-green vegetables, starchy vegetables, red and orange vegetables, beans and peas, and other vegetables. Try to include vegetables from each group, try to make sure you aren't only picking options from the "starchy" group. Keep plenty of frozen vegetables handy in your freezer. Buy pre-washed salad and pre-chopped veggies to cut down on prep time. Add veggies to soups and stews. Add vegetables to spaghetti sauces. Eat raw carrots, broccoli, or bell pepper strips dipped in hummus or ranch dressing as a snack. Fruits can be fresh, canned, frozen, or dried. Put out a fruit bowl and keep it full of fruit. Stock up on dried, frozen, or canned fruit, so you always have it available. Choose fruit that is canned in water or juice instead of syrup. Buy pre-cut fruit in packages to cut down on prep time. Try meat dishes with fruit, such as pork with apricots, lamb with figs, or chicken with mango. Grill peaches, apples, or other firm fruit for a healthy, tasty dessert. Try a smoothie made with chopped fruit and plain yogurt for breakfast. Use dried fruit to add texture to trail mixes. Protein foods include meat, poultry, seafood, beans and peas, eggs, processed soy products, nuts and nut butters, and seeds. Beans and peas are also part of the vegetable group. Choose meats that are low in saturated fat and cholesterol, such as lean cuts of beef and chicken and turkey without skin. Most adults need 5 to 6 1/2 servings of protein a day (also called "ounce equivalents"). Children age 8 and younger need about 2 to 4 servings. Seafood high in omega-3 fats, such as salmon, sardines, or trout, can help prevent heart disease. Peanuts and other nuts, such as almonds, walnuts, and pistachios, when eaten as part of a healthy diet, can help lower the risk of heart disease. Lean meats and eggs are a good source of iron. Choose lean cuts of beef, which include sirloin, tenderloin, round, chuck, and shoulder or arm roasts and steaks. Choose lean pork, which includes tenderloin, loin, ham, and Canadian bacon. Choose lean lamb, which includes tenderloin, chops, and leg. Buy skinless chicken or turkey, or take the skin off. Grill, roast, poach, or broil meats, poultry, and seafood instead of frying. Trim all visible fat and drain off any fat when cooking. Substitute peas, beans, or soy in place of meat at least once a week. Try bean chili, pea or bean soup, stir-fried tofu, rice and beans, or veggie burgers. Include 8 ounces (225 grams) of cooked seafood a week. Consuming dairy foods is important for improving bone health especially during childhood and adolescence, when bone mass is being built. Dairy foods have vital nutrients including calcium, potassium, vitamin D, and protein. The intake of dairy products is linked to reduced risk of cardiovascular disease, type 2 diabetes, and lower blood pressure in adults. Low-fat or fat-free milk products provide little or no saturated fat. Include milk or calcium-fortified soymilk as a beverage at meals. Choose fat-free or low-fat milk. Include plain yogurt or cottage cheese in smoothies. Use lactose-free or lower lactose products if you have trouble digesting dairy products. Also, you can get calcium from non-dairy sources such as fortified juices, canned fish, soy foods, and green leafy vegetables. Oils are not a food group. However, they provide important nutrients and should be part of a healthy diet. Saturated fats such as butter and shortening are solid at room temperature. They contain high levels of saturated fats or trans fats. Eating a lot of these fats can increase your risk of heart disease. Oils are liquid at room temperature. They contain monounsaturated and polyunsaturated fats. These types of fats are generally good for your heart. Children and adults should get about 5 to 7 teaspoons (25 to 35 milliliters) of oil a day. Children age 8 and younger need about 3 to 4 teaspoons (15 to 20 milliliters) a day. Choose oils such as olive, canola, sunflower, safflower, soybean, and corn oils. Some foods are also high in healthy oils. They include avocados, some fish, olives, and nuts. You can use the online SuperTracker to learn what you currently eat and drink. By writing down what you eat and drink every day, you can see where you can make better choices. You can use the Daily Food Plan to learn what to eat and drink. You just enter your height, weight, and age to get a personalized eating plan. Use the SuperTracker to track your daily activity and food you eat, plus your weight. If you have any specific health concerns, such as heart disease or diabetes, be sure to discuss any dietary changes with your doctor or registered dietitian first. Eating the right amount of calories to keep you at a healthy weight. Not overeating and avoiding big portions. Eating fewer foods with empty calories. These are foods high in sugar or fat with few vitamins or minerals. Eating a balance of healthy foods from all 5 food groups. Making better choices when eating out at restaurants. Cooking at home more often, where you can control what goes into the foods you eat. Exercising 150 minutes a week. Decreasing your screen time in front of the TV or computer. Getting tips for increasing your activity level. US Department of Health and Human Services and US Department of Agriculture. 2015-2020 Dietary Guidelines for Americans. 8th edition. health.gov/dietaryguidelines/2015/guidelines/. Updated December 2015. Accessed October 16, 2017.